Richard Thomas (John-Boy Walton from 'The Waltons') stars as David Robinson, in this amazing tale of a family looking for adventure only to find themselves marooned on a deserted island. Having no means of provision or shelter they struggled to survive against pirates, natives, wild animals and Mother Nature. A story of adventure, love, heartbreak, happiness and human drama, 'The Adventures Of Swiss Family Robinson' is a fantastic trip for the whole family. The 'The Adventures of Swiss Family Robinson' competition has now closed. Winners will be announced shortly. Competition opens at 5pm AEST on Sunday 29th July 2018 and closes at 11:59pm AEST on Sunday 5th August 2018. Five winners will be chosen at random on Monday 6th August 2018. To successfully win, entrants must fulfil the above entry conditions before the time the competition closes. Current members/followers are eligible to enter the competition. Only one entry per person. Only one winner per household. To be a valid winner, the entrant must not have won a prize from SWITCH within the last 28 days. 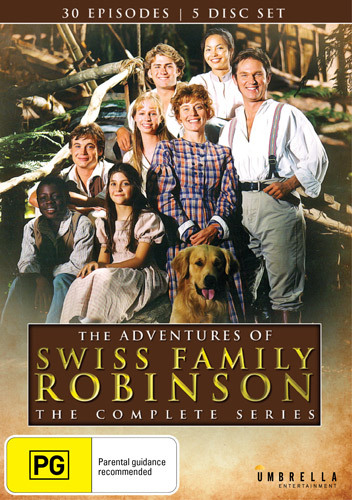 Each winner will receive one DVD copy of 'The Adventures of Swiss Family Robinson'. By entering, you agree to receive occasional emails from SWITCH in the future. If you decide to unsubscribe from these updates, any further entries will not be applicable. Only Australian residents are eligible to enter. 'The Adventures of Swiss Family Robinson' is available on DVD on Wednesday the 1st August 2018 from Umbrella Entertainment.